After visiting Jupiter in 1979, the next destination for the Voyager mission was Saturn. 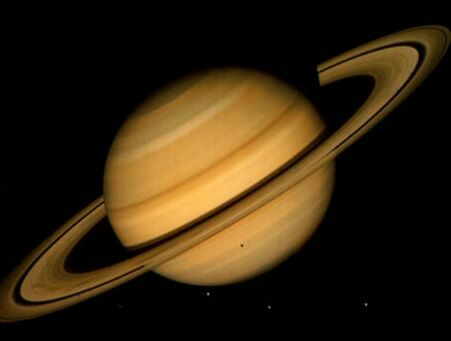 Saturn isn’t a difficult target for a modest telescope on earth, visually or otherwise, and a nice telescope can even work out details in the rings and sometimes its largest satellite Titan, despite it all being about 750 million miles away. So, in the fall of 1980, Voyager 1 finally arrived and began sending back images and data that forever changed the way we think of Saturn, its rings and satellites.Voyager 2 would be right behind it, arriving in the summer of 1981. 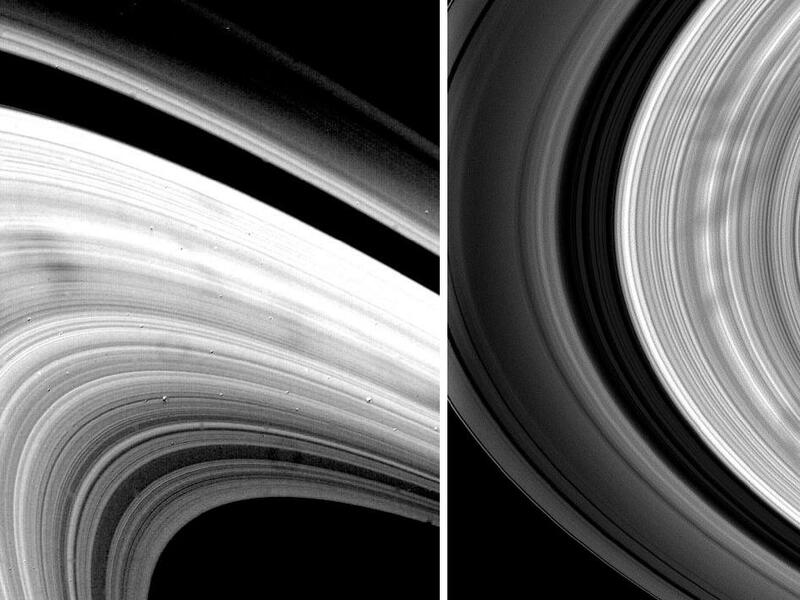 When Voyager 1 sent back the first images of the rings, astronomers began to theorize about how the now visible structures of the rings might occur and be maintained, some of which were quite unusual. Some thought the smaller gaps were being cleared out by larger objects orbiting within the rings, but the better cameras on Voyager 2 showed nothing of the sort. We now know that there are moonlets and shepherd satellites within the rings, but even with the fine images from Voyager 2, the rings are still extremely huge and these were not visible, but they’re not the whole story anyway. The simple way to explain it is to simply say that the rings are held in place with a gravitational dance between Saturn and the moons that orbit it. It’s a complex structure, but very elegantly maintained. This references the Cassini mission, but it gives some idea of how interesting the Saturn system really is. Of all the satellites orbiting Saturn, none is more unusual than Titan. It’s bigger than Mercury, has an atmosphere thicker than Earth’s and if it weren’t orbiting a larger planetary body, we’d consider it a planet on its own. Observations in the beginning of the 20th century revealed Titan’s atmosphere, but it wasn’t until the early 70s that Carl Sagan suggested that Titan’s thick methane smog might be producing complex organic molecules, which would rain down and collect in pools. 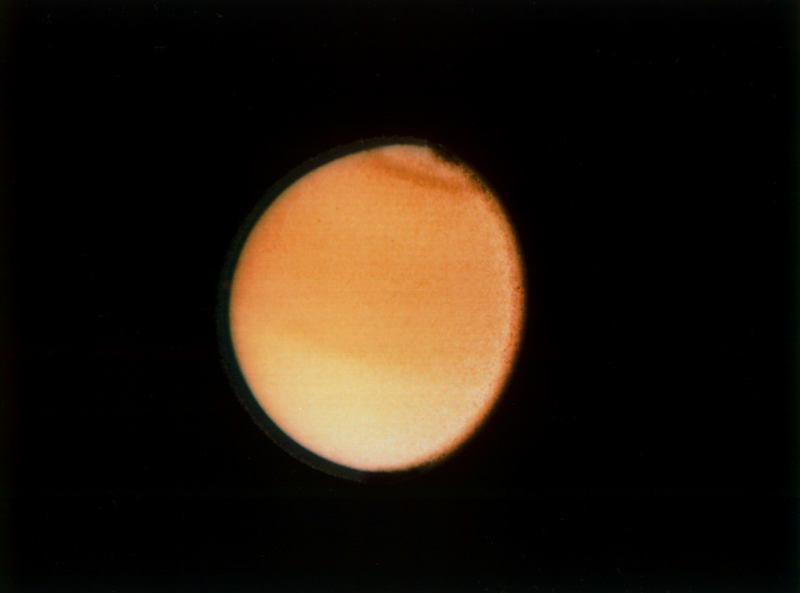 Since the atmosphere is almost totally opaque at virtually all wavelengths of light, we didn’t get confirmation on the hydrocarbon pools until recently, but Voyager did confirm the nature of the atmosphere itself. Come for the ethane lakes, stay for the atmosphere. Voyager revealed a tremendous amount about Saturn’s composition, dynamics and the way the rings and satellites interact, plus a few additional satellites we hadn’t seen before. It did exactly what it set out to do and laid the groundwork for future missions like Cassini and the eventual landing of the Huygens probe on the surface of Titan. To keep it all in perspective, that large gap, called the Cassini Division, is about the size of Earth's radius. It’s terribly fascinating stuff, but from here on out, further planetary explorations would be done by Voyager 2 alone. Voyager 1 took a hard left after Saturn and begun its journey into the great unknown, which it still hasn’t quite reached even after three decades. The next stop for Voyager 2 is Uranus, which funny name aside, has some truly crazy stuff going on.